Julius Starke, at left, in front of his studio/home. For well over a century, Santa Barbara has been home to a thriving artistic colony of stunning diversity. Numbered among these artisans was Julius Starke, who did wondrous things with wood. Starke was born in Dresden in 1837. Not much is known of his early life. He apparently learned woodworking from peasant neighbors near his home. He traveled around Europe as a young man and spent time in Paris and London. While fine tuning his woodworking skills, he also studied botany and conducted research in the botanic gardens of Paris. In the 1870s, Starke came to the U.S and journeyed to California by horseback. Reportedly he had undergone a number of financial setbacks and his health had suffered, so he sought out the healthful climes of the West. He eventually made his way to Yosemite and was captivated by its grandeur. For the next few years he “led the life of the hermit” as one newspaper account put it, studying the flora of the region and collecting specimens. Some of the latter were unknown to science, and he was given the honor of naming one of his discoveries — Garrya fremontii, after John C. Fremont. 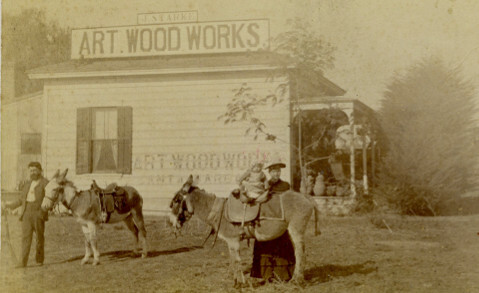 For a time Starke and a partner ran a woodworking studio near Yosemite, and here Starke developed his reputation for working with woods of the high Sierra Nevada. He became especially adept at marrying woods of different colors and grains into a harmonious whole. One table he created included no less than 14 native California woods. In addition to furniture he made a wide variety of smaller items including canes, cuff buttons, riding crops, napkin rings, and all types of boxes, most utilizing numerous woods with beautiful, detailed inlay work. Among his most interesting pieces were a series of small boxes. One was a miniature mountain cabin with a giant sequoia, done to scale, to show just how huge these trees were out in the wild. The cabin was actually a matchbox, while the tree contained a cigar case. For most of his years here, Starke’s residence and shop were in the first block of East Sola Street, positioned to be near the tourist trade at the Arlington Hotel. Toward the end of his life he relocated to the first block of West Haley Street. In addition to his wood masterpieces he sold any number of “curiosities,” including Indian artifacts, sea shells, basketry, pottery, and engraved silver — anything he felt would be of interest to the tourist. In 1905 he published California Woods, a paean to the beauties of Santa Barbara, Yosemite, and his own work. In the booklet he cited 41 woods he used in his creations. 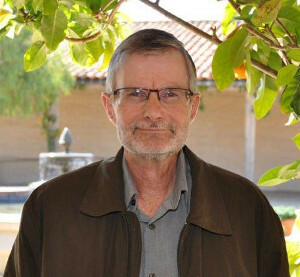 A lover of the outdoors, he often could be found in the Santa Barbara backcountry. His last hike came just three years before his death when, at age 78, he ascended the Cold Springs trail with friends. Starke died in March 1918 and was eulogized as “one of the best known characters in Santa Barbara” whose woodworking skills “gained a nationwide reputation.” Sadly, it appears that few of his works survive, although the Santa Barbara Historical Museum has in the collection one of his California wood tables. As Starke put it in California Woods, “Those artists who go to Nature to seek for the beautiful always come back full-handed.” His craft embodied that belief.